A month has passed since the eclectic crew of the Covenant Patrol vessel Jinxed Thirteenth endured a harrowing mission on the abandoned space station of Moria 3 and rescued its sole surviving crew member. During the mission, Moria 3’s deranged AI all but crippled the Jinxed Thirteenth, and the skeletal crew is now desperately trying to get it repaired. Waking from several millennia of cryo-sleep, Jessie Madison’s worst fears are confirmed. She is the last surviving member of the Human race. Surrounded by the descendants of mankind in a world she knows nothing about, not even the basic alphabet, Jessie finds herself only able to communicate with the ship’s medic, Marla Varsin, and its translator, Machina Chord. When the merchant vessel Althena arrives on the scene, its captain, a shrewd trader named Domiant, offers to sell Captain Morwyn the parts he needs. 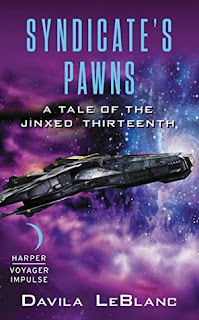 As guards are lowered on the Jinxed Thirteenth and repairs get underway, it becomes evident that a cunning foe has managed to infiltrate the ship. A deadly game of deception begins to play out, with a sinister foe setting its sights set on capturing Jessie. 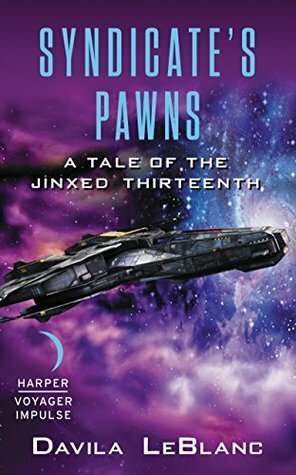 Captain Morwyn Soltaine, the crew of the Jinxed Thirteenth, and Jessie Madison find their mettle tested as they are dragged into a desperate battle for survival. So far? I’m still riding the pride of being published. It’s a really cool feeling. I’m from a big family and so you quickly learn to observe the different relationships that grow between the different members of the family. Even during bad times, there will always be a bond. That has seriously influenced how I portray the dynamic of sibling and family in my stories. Very few of my characters have “no-family/friends/ or were orphaned from birth”. It feels from the moment I was able to read I could write. That being said, when I was twenty I was incredibly critical of everything I watched or read. Nothing was ever good enough for me. I remember complaining about a movie I hadn’t liked saying something to the effect “I could do it better” and suddenly I had the thought: if I could do it better, why wasn’t I just doing it? I started writing and never stopped. It was when I got my first payment for the outline to the pilot script for League Of Super Evil. I think I almost wept. Up until then I’d been writing and editing people’s work for free or for laughably low sums of money, just to get the training. That day was a great moment and I knew from then on that I would be able to make a living as an author. Watching the real world in front of me. I’m almost always thinking in story/narrative mode. I love crafting new worlds and telling stories. This is where I am at my happiest and most productive. I feel like the more I write the closer to my truer self I become. I have a hard time whenever I’m NOT writing. Fantasy and Sci-Fi, easily. These two genres have inspired me so MUCH throughout my life that I find it hard to even imagine a time when I wasn’t writing or reading fantasy and science fiction. Because I love these genres so much I have an incredibly fun and easy time writing for them. My friend Jocelyn Baxter told me to take the NaNoRemo challenge. I figured I could write a book in month no problem. And I spent a MONTH writing the outline to my first book. Then I got depressed until another fellow creative: Jaymie Dylan, reminded me that I still had a working outline for a book and could probably still write it. It was an important test for me as a writer. I’ve written screenplays before. But a full novel? That was something new and I’m really glad I listened to my friends on this one. My wife Jessie Mathieson. I came home after a party evening and professed to her that she was going to be the main character of my first book. She laughed and kissed me and probably even playfully thanked me for the honor. But I don’t think either Syndicate’s Pawns or Dark Transmissions would have been possible without her. It will sound odd but it’s coming up with a story that will keep ME hooked. I know that if I can be hooked on the story that other people will be turning the pages. Coming up with that crucial initial through-line, which looks so simple, is actually the hardest part of the entire process. Once you figure it out, you just follow that through-line to its conclusion and through in as much surprise along the way. Do not self-edit until you are done the first draft, resist that urge, because if you give in you will wind in a perpetual editing loop. Resist and instead keep a notepad nearby so you can write down all your extra thoughts/notes. All of which you can chose to incorporate while editing a completed working draft. Yes I do. I plan on making a living as a professional writer and author. I try to keep my pace quick and relentless. I’m a big fan of films like Dredd or the Raid and I think that style of storytelling influences me greatly. I don’t like giving my characters a chance to breathe until the story is done. It makes for great tension. My knowledge of story-telling technique. I’ve been really lucky to have some really experienced industry professionals in the story-editing world and they’ve shown me a lot. Because of this I’ve developed a good sense of pacing. My general all-around passion for storytelling would be another. I love to write. My ability to listen and take feedback, not only on my writing and work but in my every day life as well. I’m a pretty smart guy and sometimes that causes me to easily get jaded. This shocks people because I’m generally a very upbeat person. But sometimes it is a real struggle to do that. I try my best though to not let that affect either my work, or my day-to-day. “Yesterday is history. Tomorrow’s a mystery , but today is a gift which is why we call it the Present.” Its from master Oogway in “Kung-Fu Panda”. When I heard that quote I was just starting to read up on Zen teaching. That verse from a children’s movie really marked me as quite beautiful. I’ve tried to live my life with that philosophy in mind since.